More than one-third of US citizens are putting their lives at risk. This is the amount of people the Centers for Disease Control and Prevention says are obese, which betters their chances for heart disease, Type 2 diabetes, stroke, and certain cancers. For years, various stakeholders from nonprofit, healthcare, and government realms have created awareness programs and campaigns to contain the growing epidemic, only for American waistlines to continue to expand. A reason for the confounding phenomena may be that many fat-fighting campaigns are stigmatizing overweight people instead of encouraging healthier behaviors, according to a recent study from Yale's Rudd Center for Food Policy and Obesity. 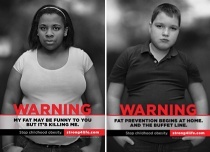 The study found 57% of people considered the Strong4Life tagline - chubby kids may not outlive their parents - to be stigmatizing, and just under half said it would prompt them to change their behavior. Trudy Kremer, a partner at Jackson Spalding, felt the study asked the wrong questions. Her client, Children's Healthcare of Atlanta, is behind the campaign. "It appears to have measured whether or not messages were perceived as motivating people to change," says Kremer.. "That is comparing apples to oranges because the campaign was created to raise awareness of the childhood obesity crisis - not motivate change." "That can't happen if people don't first realize they need to," she adds. Her client feels the campaign has been a success, based on that criteria. The initiative is now moving into a new phase entitled The Talk, which is focused on self-awareness and asks parents to recognize the barriers holding them back. The organization relaunched Strong4Life's website this past September with tips to help parents have a conversation with their children. "We have to try to convince that mom, who may be short on time and money, it's better to talk to her kid about how vital more vege-tables are than to serve pizza," says Tim Whitehead, VP of marketing and communications at Children's Healthcare of Atlanta. The long-running America On the Move campaign credits its longevity to its main message: By taking only 2,000 extra steps each day and consuming 100 fewer calories each day, Americans can curb the average weight gain of one to three pounds per year. About 42% of the US population will be obese by 2030, according to a report in the May 2012 edition of American Journal of Preventive Medicine. The report suggests an additional 30 million Americans will be obese in 18 years. As a result, this would cost an additional $549.5 billion on medical expenditures. It also predicted an increase in the number of individuals with severe obesity, with rates rising to 11% by 2030. Severe obesity is defined as being roughly 100 pounds overweight. "One of the greatest ways to start tackling the issue is by making changes that are attainable to everyone," notes Wendy Artman, senior director of communications at GroundFloor Media, the PR firm that helped launch the campaign. "That means taking small steps first and moving toward a greater goal." Organizers feel the campaign was a success as it was more preventive than reactive in nature. "I have not seen any cases in which a campaign has been successful in helping treat obesity," says James Hill, cofounder of the America On the Move Foundation. He credits this to the fact that the changes needed to shed weight may be larger than what some people are willing to make. "The first strategy should be not gaining the weight or stopping weight gain from getting worse," Hill adds. "Once people make a small change, it eases the task of taking larger steps." Chandler Chicco Agency also notes great success with the work it has done for the Strategies to Overcome and Prevent Obesity Alliance, which it helped set up five years ago. It says work done by the organization played a part in Medicare announcing last year it would pay for screenings and preventive services to help recipients curb obesity. It may also have helped to lead the US Food and Drug Administration to consider letting makers of obesity treatments conduct faster clinical trials with a smaller group of patients. "Results have been real and tangible," says Chandler Chicco's Allison May Rosen. "Our focus has been on what it takes to be healthier as opposed to what leads to a better appearance."